A little over a week ago, we arrived in Bangkok with a bit of unfortunate timing. Within an hour of our arrival, a bomb went off at the Erawan Shine in central Bangkok. When traveling to distant places around the globe, there’s always a chance of encountering dangerous or unfortunate circumstances. We knew this going into the trip but never really expected something like this to happen so close to where we were traveling. Unsure of what to do next, we decided to lay low for a bit, following the news and trying to use this information to gauge the safety of the area before determining next steps. We didn’t want to ignorantly assume everything would be okay, but we also didn’t want fear to dictate how we reacted to the situation. So, after praying for guidance and discussing the situation with a few friends living in Bangkok, we felt comfortable about staying and enjoying the week we had slated there. As I mentioned, we were a little reluctant to do our usual thing and run all over the city exploring all that Bangkok had to offer. Because of that, the first few days were a little strange and uneasy. It wasn’t until we got some really great news a few days into our trip that things took a total 180-degree turn for our mental mindset. One of our best friends, Josh, had been trying to arrange a visit with us. He volunteers for a disaster-relief organization called ShelterBox, and was on a deployment to help with a flooding situation in Myanmar (one of the countries bordering Thailand). 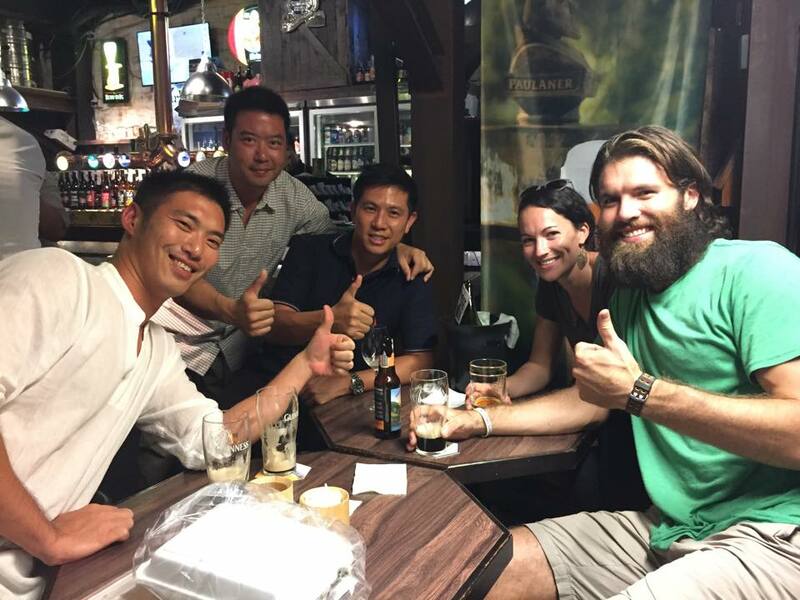 The funny thing is that this deployment originally altered Josh’s plans to meet us in Bangkok earlier in the month; however, after his time there was unexpectedly cut short, he was able to re-route his flight and join us in Bangkok! I can say with absolute certainty that the phone call from Josh to let us know he would be coming to Thailand is one we will never forget. Josh also invited his new friend Jess, who he met on the deployment in Myanmar, to come along to Bangkok and she rounded out our group to make for an incredible four days! The day of their arrival was the first day that we really got out of our hotel to do some exploring. We started with a walk around the area surrounding our hotel, starting with the well-known Khao San Road. Many backpackers and expats spend their time here, and it is lit up at night much like a street in Las Vegas. We were fortunate to be within walking distance, but not so close that we were unable to experience a more authentic (and less busy) part of Bangkok. After making our way through the street stalls filled with food, clothing and other souvenirs, we made our way over to the Grand Palace. The Grand Palace served as the residence of the King and the royal Thai family up until 1925. Since then, it has become the number one tourist attraction in Bangkok and the site of some spectacular temples and beautiful architectural buildings. We walked around the outside of vast complex (as it was already closed for the day) and headed towards the Chao Phrya River. The sun had already set and we were able to view Wat Arun, the Temple of Dawn, lit up across the river. It was beautiful! Jess, Josh and I outside of the Grand Palace. In the days that followed, we were able to do and see some really cool things in Bangkok: we visited the Wat Pho temple complex which features a 46-meter long and 15-meter high Reclining Buddha; attended a full-slate of Muay Thai fights at Rajadamnern Stadium (one of the two primary Muay Thai stadiums in Bangkok); ran a race across the beautiful Rama VIII bridge; and ate an assortment of the best street food we’ve ever had. Josh summed up the city best when he said “this place is so much nicer than I imagined it would be.” When it came time for Josh and Jess to head out, we knew we were going to miss them and all the fun we had during their visit! 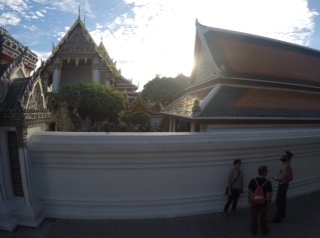 Temple of the Reclining Buddha. 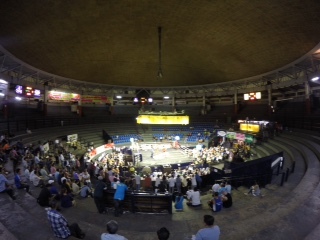 Muay Thai fights at Rajadamnern Stadium. 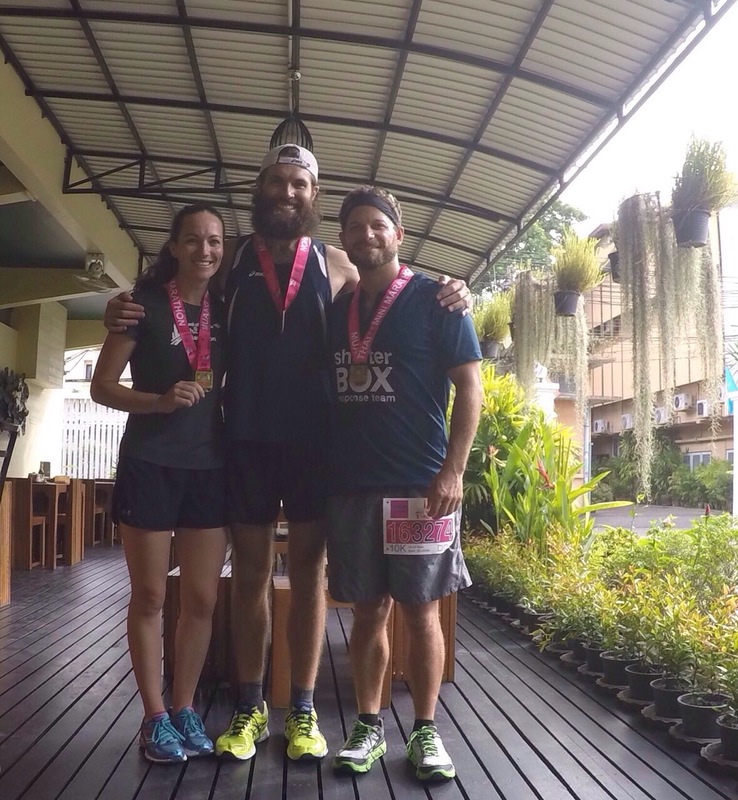 Karen, Josh and I after the race! As luck would have it, we received a message from another friend of mine on the same day of Josh and Jess’ departure. When I was running the stage race in the Gobi Desert, two of my tent mates and best friends during the race were from Bangkok. Their names are Swaek and Than, and I had told them at that time that we would be visiting Bangkok later in the year. Not knowing what they were planning and how available they would be, I touched base with them on the day of our arrival. Swaek wrote back to let me know that they would be available later that evening for dinner and drinks! So, we took a long (traffic in Bangkok is like downtown Chicago) cab ride over to a local Thai restaurant to meet them. We’ve expressed before that authentic cultural experiences are something we crave, and this gave us just that and more. Swaek and Than knew the owner of the restaurant we were at, so we had a full spread of some amazing southern Thai dishes. Southern Thai food is known to be the spiciest in Thailand, but the taste was so delicious that we weren’t even bothered! Left to right: Than, Bob, Swaek, Karen and me. To top it off, we spent most of the night discussing the crazy and exciting athletic endeavors of everyone at the table, which reaffirmed why I was such great friends with these guys. We also made another new friend, Bob, who showed up to join us part way through the evening. Our Thai network continues to grow! They were truly gracious guests, and no matter how hard we tried, they would not let us pay. But as they already know, the favor will be returned when they all come to visit us in the states! As we reflect on our time in Bangkok, we recognize that it was defined by the love of our friends. We needed them, and God provided them at just the right time. We couldn’t be more grateful for how everything turned out, especially given the shaky start. While we feel extremely fortunate to have been safely in our hotel at the time of the bombing, we recognize that many people were not. We continue to pray for those who died or were injured in the bombing, the families of everyone impacted, and the country of Thailand. Come see more at the Kimblesinbits YouTube page. Our Thailand video (below) is now live! Our pleasure, Peg! Thanks again for your support and encouragement along this journey. It’s been so special for us! Yosemite, you are a super babe. The early bird shreds the gnar. Baby, it's cold (and beautiful) outside. Another bluebird day, complete with calm waves and ice covered rocks.